The sport is likely to be included in the 2019 Asian Games, which will be hosted by the Vietnamese capital of Hanoi. 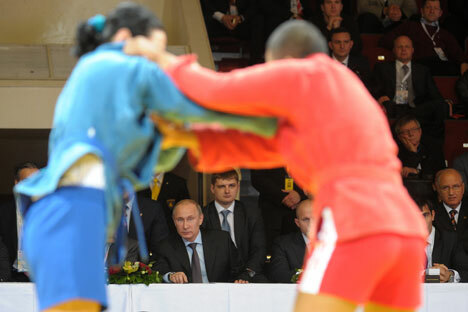 The Russian martial art of Sambo, which is essentially Soviet-style wrestling has been included in the Asian Games by the Olympic Council of Asia (OCA). The sport, which turned 75 last year is played in 75 countries and several Asian countries including India, Iran and Kazakhstan. The OCA decided to include the sport at its general assembly meeting in Manilla last month. Sambo will however not be a part of this year’s Asian Games, which will be held in Incheon, South Korea in September-October 2014. The sport is likely to be a part of the 2019 edition to be hosted by Hanoi. Sambo, a mixture of different wrestling styles, is the most popular martial art in Russia, with more than 400,000 people believed to be practising the sport in the country. The pioneers of the sport were Viktor Spiridonov and Vasili Oshchepkov, who spent much of his life living in Japan and training judo under its founder Kano Jigoro. His connections with the country led to accusations from the Stalin regime of being a Japanese spy and Oshchepekov died in prison in the mid-1930s. Spiridonov traveled to Mongolia, China, and India to study the Mongol-Vedic martial traditions over a period of ten years. Spiridonov and Oshchepkov independently developed two different styles, which eventually cross-pollinated and became Sambo. From the 1950s, the sport began to increase in popularity in the Soviet Union as a national martial art. International competitions began in 1972. In 1981, the IOC recognized Sambo as an Olympic sport and in July 2013, Sambo competitions were held for the first time at the World Student Games in Kazan. However, Sambo is not a part of the Olympic Games. The Sambo Federation of India was established in 1994 and reconstituted in 2009. The federation is headquartered in the southern Indian city of Bangalore.